My Blossom II entry “David Austin Roses & Hydrangeas” is a pastel painting on paper. I decided to paint the same vase that I used in my first Blossom painting. My inspiration this time was to combine the old with the new. The two species of David Austin Roses I painted were purchased this summer and were new to my garden. The hydrangeas had been in my yard for many years. 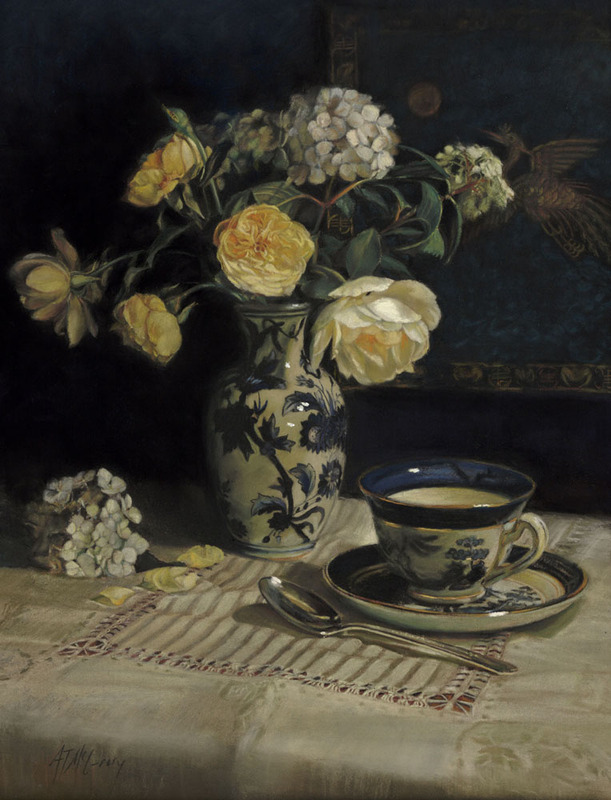 I had my old blue and white china vase, a recently purchased tablecloth, a teacup with saucer from the local consignment store, an old piece of silk embroidery, and a silver spoon from my Aunt’s silver service. I brought together the old and the new, combining beautiful flowers, new treasures, and pieces that hold dear memories to create my painting. For the first time, beating the odds of short cool spring and hot summer in Texas, I was able to grow a bigger-than-bowl sized dahlia; it blossomed in my garden early in May. Every morning, I greeted four buds, which blossomed and withered. I was amazed and proud of this magnificent beauty and sheer size of it. Of course, I wanted to paint it. I cut one flower and set up with my crystal bowl. I wanted to adorn the flower with a sheer background to continue the rhythm of the petal pattern. One of the most magnificent and yet fragile flowers that I have seen is the tree peony in my front yard. Even a minor rain shower can destroy the tissue-paper thin petals. I wait patiently every spring for the buds to burst into flower and then pray that the rain will let me enjoy them for a while. I wanted to capture the fragile beauty of this peony in a piece of art. 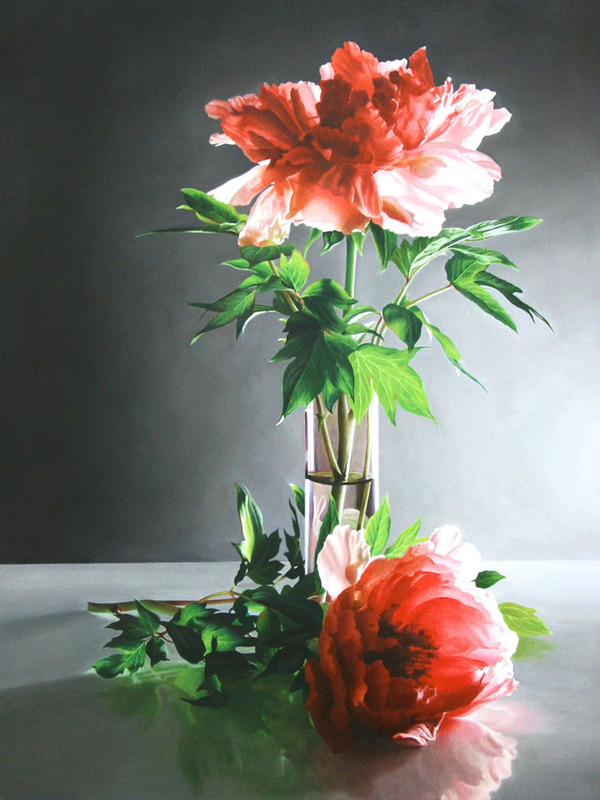 Through the use of dramatic back lighting I was able to highlight the peony’s delicate petals. 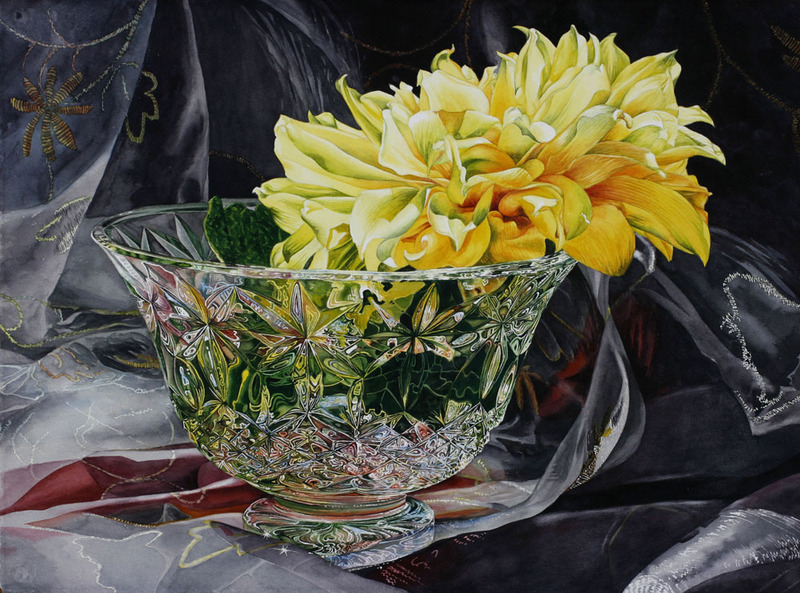 The painting lets the viewer see the inherent qualities that make this flower so special. 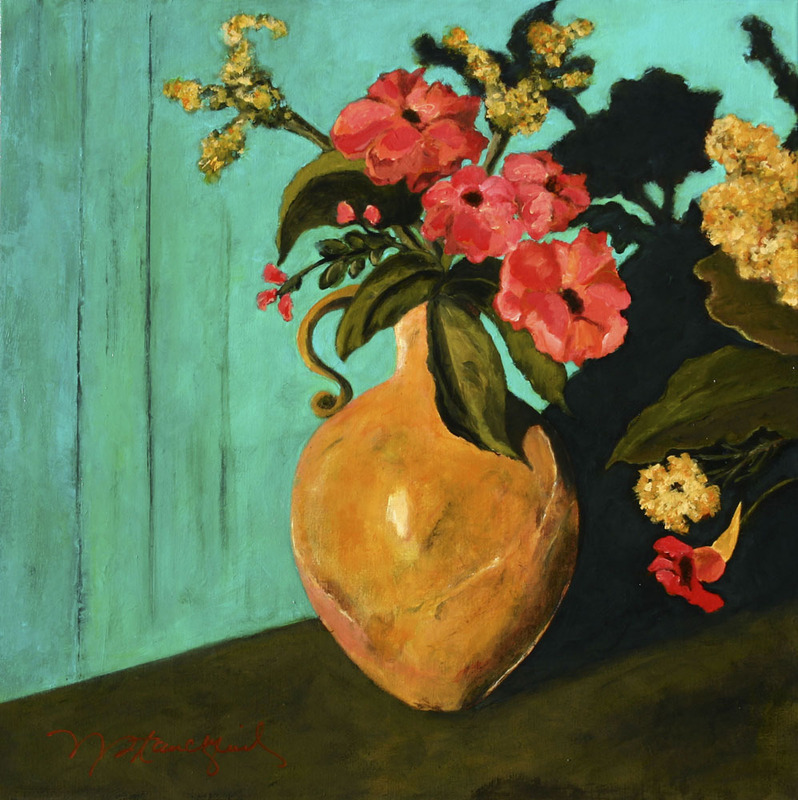 The moment I saw the coral blossoms in the ochre pot, I knew that I had to paint them. Inspired by the autumnal foliage and blossoms, they seemed a perfect accompaniment to the crudely formed nature of the pot. The silhouette added drama and further accentuated the light reflected on the pot. As a nature artist with a background in science, biology, zoology, and botany, I have devoted much of my artwork toward promoting and funding conservation. I build butterfly gardens and teach others to build them. 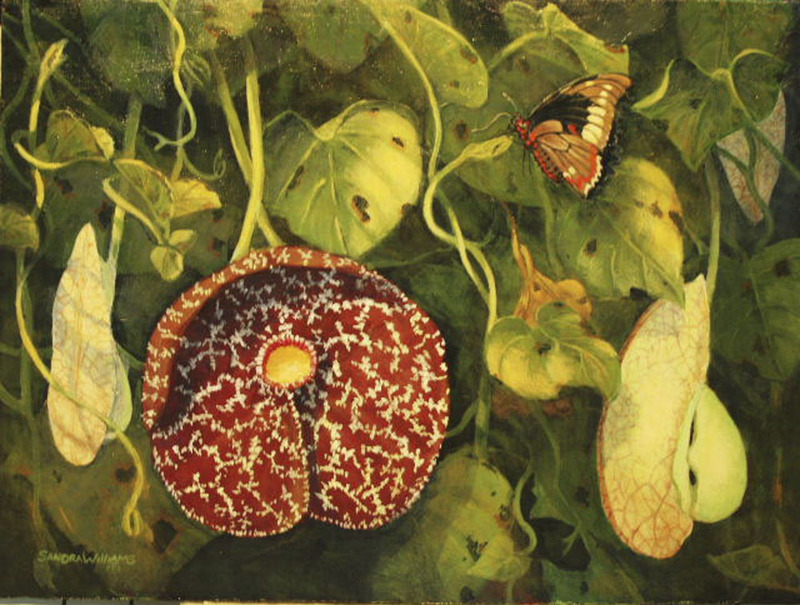 The Dutchman’s Pipe Vine is a favorite of mine, host to the threatened Black Swallowtail Polydamus butterfly. From one small plant, which I planted at the base of a dead tree, it became a 25’ canopy covered in blooms. In season as many as 50 or more butterflies can be seen on it all day. I simply had to paint it!